Eva flings herself down and utters the all too familiar words, 'I'm bored!' In response, Mum inspires Eva to find her imagination. And so begins an exciting adventure for Eva and her dog, Chops. Wenda Shurety's confident text carries the reader along on this adventure. Eva makes a list of all she and Chops will need and they set off down a narrow valley, with the sun shining brightly. The initial illustrations, by Karen Erasmus, reflect Eva's mood, but, as Eva starts to hunt for her imagination, everything changes dramatically. Delightful shadow images appear, hallways become valleys and the legs of the tables and chairs transform into a pine forest. As the story builds, Eva and Chops delve further and further into the wilderness of Eva's fabulous imagination. The contrast in illustrations that occur as soon as the hunt for Eva's imagination begins, is quite breathtaking. In the early pages, Erasmus uses predominantly straight lines, minimalist tones and realistic representations, then, an imaginary forest world starts to overlay the household scene. Imaginative visions are everywhere. It seems Eva imagines herself as an explorer, Chops envisions a wolf and even Eva's cat, who is hiding around a corner, is perhaps imagining itself as a panther. Shurety's text describes the adventurers travelling over bridges, into caves and through rainforests, whilst the illustrations flick back and forth from the home setting to the imaginary setting. 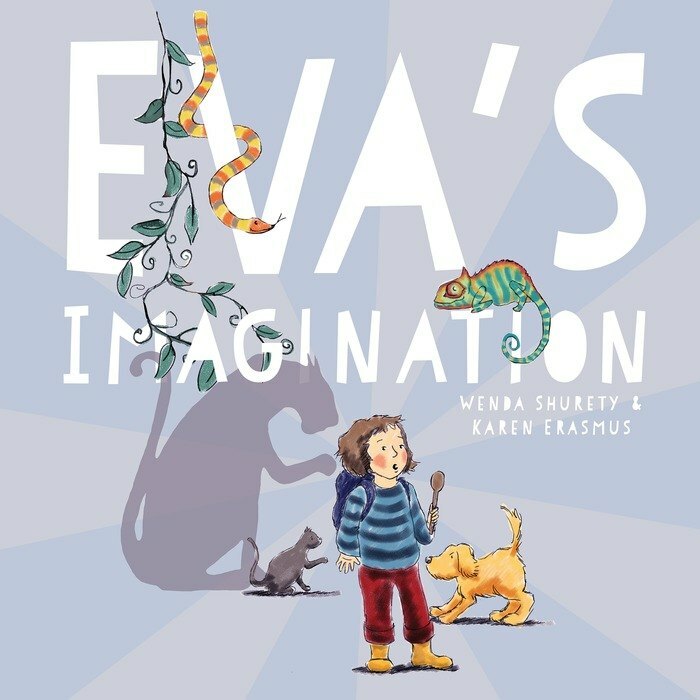 Eva's Imagination will inspire many young readers to set off on their own adventures at home, where the world is just an imagination away.